Sometimes I find it hard to believe that The Center has been around formally since 1993 and that we have been doing this work really, for almost three decades. We began as a team of forward thinkers with a vision for creating healthcare facilities that promote healthier environments for patients and staff. Since then, this vision has become a movement. Looking back over the years, it's remarkable to note that there have been vast changes to healthcare facilities since our early days, ranging from incorporating technology into every aspect of the design to integrating thoughtful design and operational details that can reduce falls and infections. These changes are not only becoming commonplace—they’re creating positive change. Our community has grown as well and today is very diverse. 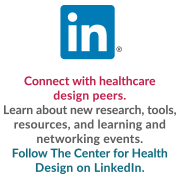 Architects, interior designers, healthcare executives, healthcare professionals, researchers, product manufacturers, educators, and students are all members of The Center, and are all committed to optimizing healthcare facilities. To keep our members and the community up to date with what is going on in our industry, The Center provides a variety of learning opportunities - sometimes in-person or through the convenience of our online offerings, that include live and on demand webinars and EBD Journal Clubs. You can view all of our events on our website calendar. Interview "How Building a Purposeful Environment Can Impact Assisted Living Residents, an interview with Kelley Hoffman"
Case Study: "Green House Design: A Natural Fit for Elder Environment"
Webinar: "The Future is Now: Integrating Technology into the New Memory Care Design"
Tool: "Universal Design Strategies: Impact of Aging Considerations Checklist"
The healthcare industry is in a constant state of flux, with patient experience as one of many emerging drivers. Other drivers impacting the patient experience, and the industry as a whole, include smart technology, sustainability, safety, and comfort. Healthcare facilities are about as complex a building type as you can get, making a career in the healthcare planning and design field far from a cakewalk. And market conditions are only complicating matters. Hospitals and health systems are responding to the financial realities of reform (and remaining unknowns tied to the Affordable Care Act), implementing measures to support population health, and trying to figure out what to do with an aging building stock—each priority shaping expectations for new building projects and, more importantly, the project team members delivering them. Healthcare A/E/C firms are responding to the new climate that’s been created, one where shorter schedules are the norm, collaboration is key, and expertise is a must. Healthcare Design more . . . Calm, peaceful and soothing. Those are a few of the words patients used to describe the waiting-room experience at Naval Medical Center San Diego as part of a study conducted by four Navy researchers. The study, “Bridging Music and Military Mental Health,” was published in the Music & Medicine journal to show the correlation between waiting room atmosphere and patient attitude, but specifically among those with military experience. The study’s 149 participants were split nearly in half with 76 experiencing a traditional waiting-room experience with a simple layout of chairs and daytime television programming. The other 73 patients were placed in a waiting room with soft instrumental music playing and nature scenes on the screen. Each participant completed an assessment of his or her waiting-room experience and the responses showed that those in the experimental group had statistically significantly higher pleasantness scores (two points) than their counterparts. Health Facilities Management, more . . .
A new five-story, 106,000-square-foot outpatient services building recently opened on the west campus of St. Luke’s Hospital, Chesterfield, Mo., which will enable the health facility to expand patient services as the community grows. Care was taken to balance exterior and interior design elements between the new facility and the existing outpatient center. An indoor walkway allows patients, visitors and staff to travel between the buildings. Planning or Renovating a Behavioral Health Facility? What Impact Do Your Design Decisions Have? Don’t miss this affordable, high-return day – a unique opportunity to learn from experts, idea-share with colleagues and re-charge your professional batteries to prepare you for today and tomorrow’s behavioral health challenges. What role can the built environment play in solving the dire and growing mental health and substance abuse crises? What impact do your design decisions have? Are you making use of the best and latest design solutions? One of the most accessed and used tools on our site is one that explores the patient room, the most repetitive space in acute care facilities, and offers many opportunities to incorporate evidence-based design features. Evidence-Based Design (EBD) Journal Clubs are free, open to all and provide one EDAC/AIA CEU. These sessions provide opportunities to interact with authors who have recently published EBD papers and articles in peer-reviewed journals such as HERD and learn as they share ways to put their research into practice. See all past EBD Journal Clubs, here.